While visiting a church bazaar this last Saturday I found the one. The Cloche was a gift from my brother-in-law and sister-in-law for my 50th Wedding Anniversary celebration last year. 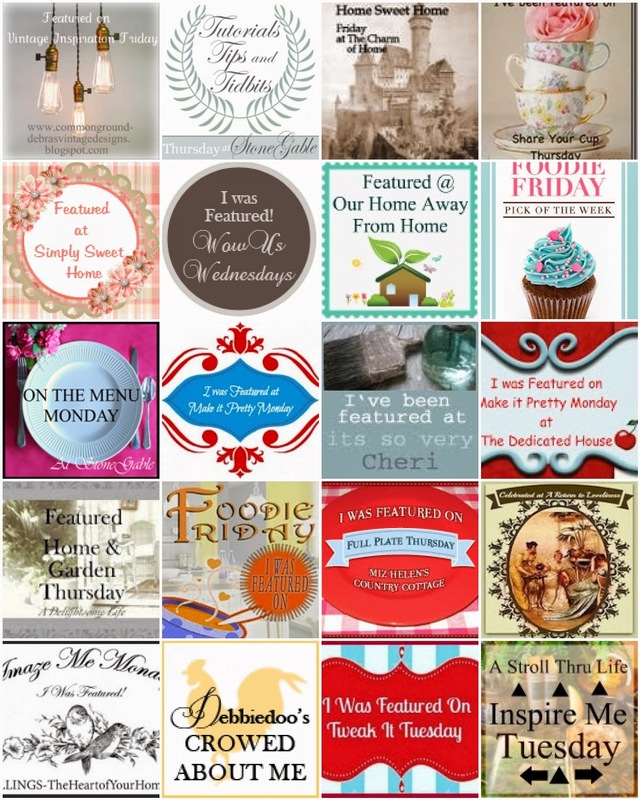 Check my sidebar for #1 50th Anniversary. 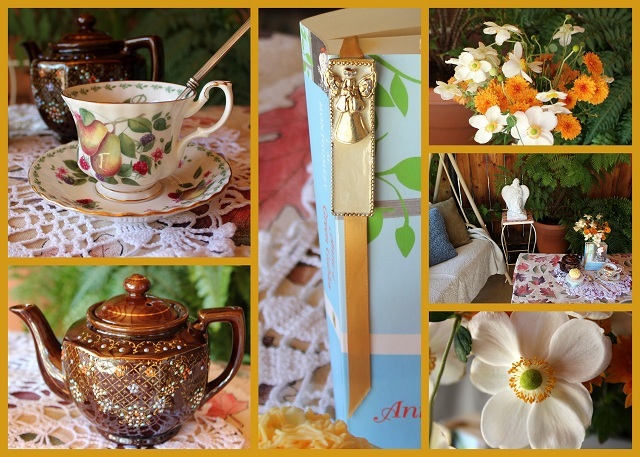 The tablescape was 'The Golden Cloche Party'...Please take a look at history. 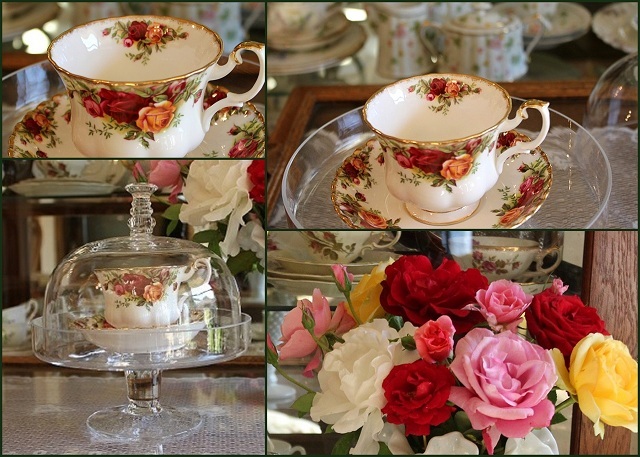 I put the tea cup and saucer in the cloche on my tea cart with some Old Country Roses from my garden to carry out a romantic look for your pleasure. The roses from my garden are: Simplicity, Don Juan, St Patrick, Dream Weaver, Ingrid Bergman and Crystalline. They look so romantic in my vintage milk glass vase. When I put a tea cup lace runner under the glass tray on my tea cart and the china in the background the romantic feeling was completely in view. 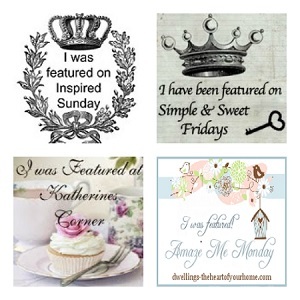 Please link back to the gracious bloggers and see so many wonderful things. I'm always inspired by the myriad of wonderful posts. I'm joining Beverly for Pink Saturday. My cake decorating class was finished on Thursday evening. For the final exam we had to make flowers and write on our cake. I decided to make Pink Roses. And I printed Blog on the top of my cake because I love to blog. Also it's October and Breast Cancer Awareness month. This post is a tribute to the research and development of a cure for the most deadly disease....CANCER OF ANY KIND. I had a great time learning the techniques of cake decorating. Making several different shades of pink was fun. Of course my kitchen looked like a bomb went off with all the powdered sugar flying out of the Kitchen Aid mixer while it's going full speed ahead. LOL. I know the printing is not perfect. But I enjoyed myself and now when I make cupcakes I can add a little more interest to them. The garden has a few interesting pink flowers still blooming. The Pink Simplicity Rose and Dark Pink Zinnias made a lovely bouquet to accompany my decorated cake display. 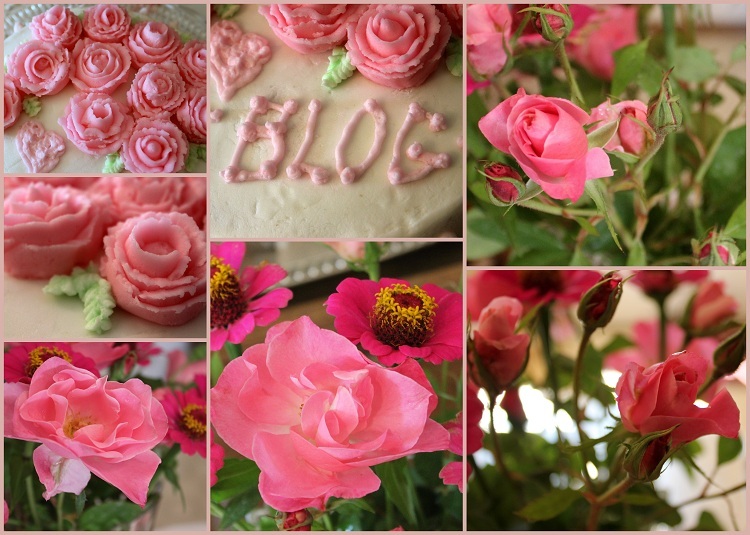 Different shades of Pink decorate the side of cake. Tip #12 and #10 round. I have been photographing my flowers and using the images as greeting cards this past year. I think this photo is going to be sent to my sweet mother who has loved roses all of her 90 years. Cake decorating takes practice to look professional. I think I will stay with my amateur status. The little green leaves are fun to make. Tip #352 with thin consistency frosting made the pastel green leaves. Thank you so much for indulging me with my learning experience of Cake Decorating. There are so many wonderful things to experience. It's going to be a busy Halloween Weekend in Blogland. 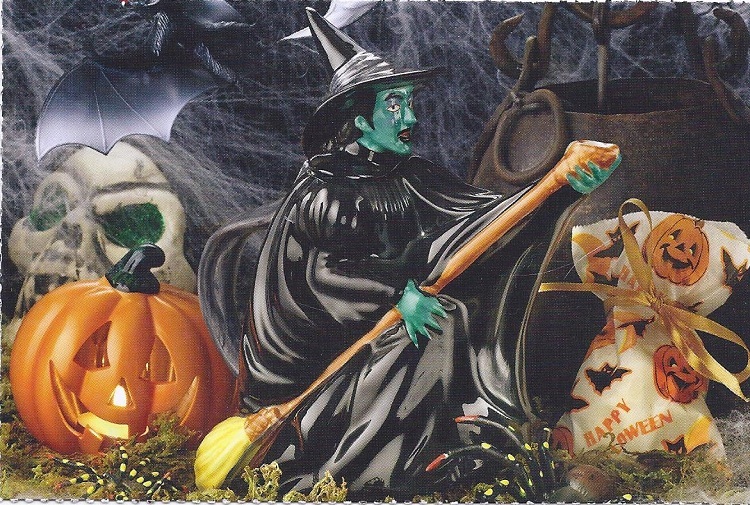 This Witch with the the broom is a Tea Pot and the broom is the spout.~I think this witch tea pot is sooo... cute. Don't you? their trip and decided to have a Halloween party. 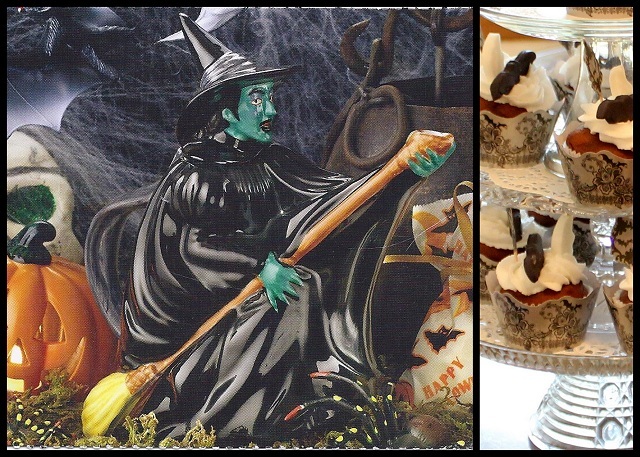 The Bats and Moons are dressing up the Devils Food cupcakes in style for the festive evening. I cut out the Moon and Bats from White fondant. Trying to color white fondant black for the bats was a real challenge . I mixed Violet and Red with a little Brown. When I work with fondant again and need the color Black, I will buy BLACK fondant or black food coloring. Another lesson learned the hard way! This Halloween Tablescape is a very Thrifty one. The cupcake aprons and picks I found on sale at the craft store. I used Royal Icing and a 1M tip to frost the Halloween cupcakes. The 'Mums' in the garden are still blooming. I picked this bucket today. I have only two plants and they are still producing more blooms. Please come back and visit again soon. My Cozy Corner Fall Retreat~With Anne of Green Gables. This afternoon I set my little tea table in the patio. The swing is covered with a Matisse bedspread I bought on clearance and the pillows are covered with a soft terrycloth. I made slipcovers so I can change them depending on the season. Of course I put one of my angels on the table by my tree fern and the Boston fern is so lush and green this year. The patio swing is wonderful reading spot on a warm fall afternoon. Now my story about Anne spelled with an e﻿ of Green Gables. 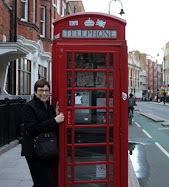 While in England I visited the British Library and in the book store I saw this book 'Anne of Green Gables.' I know most of you have read this book when you were a young person, but I never did. I thought my 11 year granddaughter would love to have this book as a memento of her grandma's trip to England. Well I gave the book to her as soon as I returned. After a couple of weeks I asked how she liked the book. "Oh grandma I haven't read it yet." That was in July. Now September rolls around and I ask " How do you like Anne of Green Gables." "Oh grandma I haven't read it yet." Hum....Now I haven't read the book and she isn't reading the book so asked her if I could borrow Anne of Green Gables for awhile. "Oh yes, grandma." What a wonderful book!!! I just love it. I think it was written for young people, but as an adult the life lessons and the descriptions of places are amazing. Now I have a new place I want to travel to. Yes, Prince Edward Island. I want to see the island thru Anne's eyes. The Chrysanthemums are still blooming in the back garden and the Japanese Anemone are profusely blooming in the front yard.﻿ Wonderful~Wonderful. October is Breast Cancer Awareness Month and I frequently buy things at a thrift store that supports Breast Cancer with the income from sales of the donations given. They have the most wonderful tea cup and saucers and tea pots for sale. I love to put tea leaves in this antique spoon that my grandmother used to use. Sometimes when I was young I would use it too. When I saw this tea pot I thought it looked just like my great-grandmother's tea pot she brought over from England in 1914. I just had to have it. I love to have my angel bookmark holding the page for my next adventure with Anne spelled with an e.
A great book, tea and a dream of a vacation to a far away place. Life can't get any better. Please come along with me while I visit some fabulous places with wonderful things to see. Cookies? Cookies? I Want to Comment! !